I have been nominated to the Reality Blog Award! Fae of Fae’s twist and Tango for the nomination! Born in Iran and raised in Japan with both parents being Persians, Fae is indeed a citizen of the world. Lived in the United States since 1971, she blogs about traveling, food and recipes. Fae’s blog is very informative when it comes to world heritage site of Japan and home cooking of world cuisines. My readers may know that I am a big, oh nope – huge fan of Japanese food, culture and the country itself. This is how I found Fae’s blog too. I appreciate Fae’s nomination as this means my blog is now recognised by other bloggers. In the excitement of receiving the nomination, I’d also like to pass on the torch so that all our wonderful bloggers in SA and Australia can share the award/wisdom/excitement with citizens of other nations. 1. If you could change one thing what would you change? Make Liberal the government. 2. If you could repeat an age, what would it be? Age 21 when I first met my lovely wife. 3. What one thing really scares you? Racism and discrimination. 4. What is one dream you have not completed, and do you think you’ll be able to complete it? Get a dream job as a celebrity food writer but never thought that is going to happen ever. 5. If you could be someone else for one day, who would it be? ehhhhh, Winnie the Pooh….so I can enjoy myself LOL! 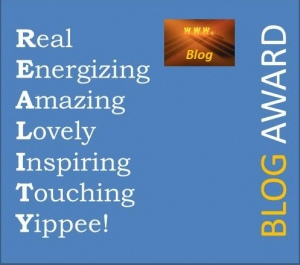 I am delighted to nominate the Following Bloggers for Reality Blog Award! Thanks so much for the award – cheers!! Congratulations! It is an award well deserved. I have yet another surprise for you! Well done! Congratulations. I reckon you deserve the award!